Brrrr! It got cold overnight in the mountains. Well, I don't think I'm a novice on dirt roads anymore. 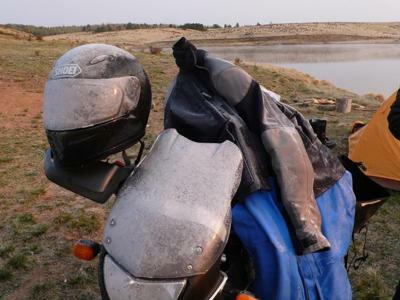 I rode my fully-packed BMW F650GS on about 80 miles of dirt and gravel roads this weekend. My boyfriend and I went camping and rock climbing for 2 days, so both of our bikes were fully loaded with camping and climbing gear. 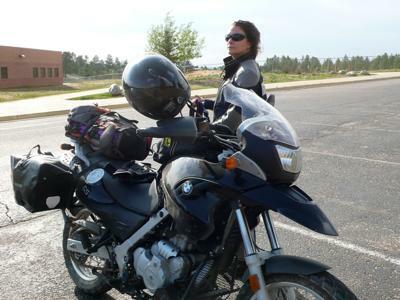 I got used to riding with my side bags and my backpack strapped to the back, a very full tank bag and a Camel Bak hydration backpack on my back. Some of the roads had VERY loose and deep gravel, which made for some scary moments when the bike was fish-tailing and I felt the front wheel trying to wash out. But, I kept the rubber side down and I made it through just fine. My first big camping trip and motorcycle adventure is in the books and I can't wait for the next one! I feel so much better after reading this! So my husband and I rode our bikes to the mountains for a family vacation. We rented a big house with a great view with the extended family. We had never been to this particular house before so to our surprise (and not a good surprise) the last half mile to the house was a very loosely packed gravel road. I have been riding for about 3 years and I don't ride every day like my husband so I was PANICKING to say the least. My bike did just fine but I felt like any second I was going to lose it. We were planning on riding while we were here but I can't seem to face that gravel road until I have to...when we leave in a few days. My husband is disappointed because the road doesn't bother him at all. But he is trying to be understanding. But after reading your post..maybe it's not as bad as I'm thinking. I can relate to that story. 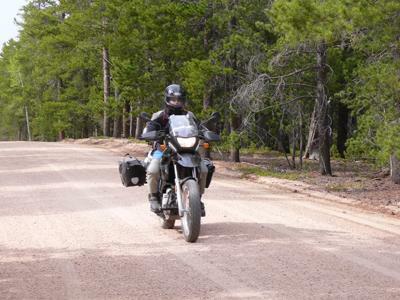 I own a F650GS Dakar also and just love the fact that it is soooo comfortable on the road as it is off. 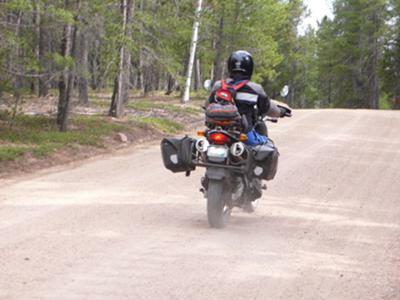 You can carry quite a bit of gear (when you have to) and the bike will go just about anywhere! Congrats on your first gravel run. I hope you enjoy many more! That's awesome!! Now, to enter a Turkey Run and do a little "real" trail riding! :D I have to say that, as a member of New England Trail Riders Association for many years, I still can't believe BMW makes a dual sport - and they're quite popular around here. They look too expensive to beat up, but still there are many of them in the woods. It looks as though you're quite an athlete. Dirt riding will put your core through a workout. Oh, the day after my first trail ride after a long, long time of not riding, I couldn't even laugh without pain. Love it though!! Thanks for sharing your adventure! What a fun but challenging trip. Great accomplishment! I am green all over with envy. I am ready to trade/sell my good ol' comfy tour bike for a sport tour or dual bike. I'm tired of having a heart attack every time I hit gravel and I want to learn to ride a bike that can handle it. Great job Stacie! For me sand & clay are tons of fun, crossing water stretches even better. But sloped gravel is the one that gits me praying the most. I was going to get a Kawasaki KLR650 off roader from my friend who's importing from Japan but he couldn't find one. To my delight, he got a BMW F650 Dakar for me--for the same money. LOVE IT! For me off road is such a challenge & really makes the bike come alive. Great job. And with climbing & all, whadda weekend! Good for you.